Proclaimed the “most profitable pool for miners,” Pool.Bitcoin.com is – in and of itself – a sort of landmark of the cryptocurrency revolution. It is apparently the personal mining pool of Bitcoin celebrity Roger Ver, and some say John McAfee is involved with it as well. Those who know their cryptocurrencies, know these names all too well. The legitimacy of the operation cannot be questioned, and that’s not because of the above mentioned names being on board. Indeed, pool.bitcoin.com has been one of the most prominent mining pools, which has played a role in the politics surrounding the SegWit vs BU issue too. As it’s obvious, the root of the pool.bitcoin.com domain is Bitcoin.com, a domain which is probably worth millions at this point, in and of itself, without an actual website hosted on it. The site is very much live though, and it offers a Bitcoin wallet as well as a plethora of information regarding Bitcoin and Bitcoin Cash. It also hosts an uncensored forum, as well as advice, news and various guides for those looking to buy or sell bitcoins. The whole outfit is indeed the very embodiment of legitimacy, although according to some users, not everything seems to be right with it. We’ll take a closer look at their grievances below. Pool.Bitcoin.com is a mining pool, which offers 110% (for a while there it may have actually been 120%) block reward, coupled with 0% fees. 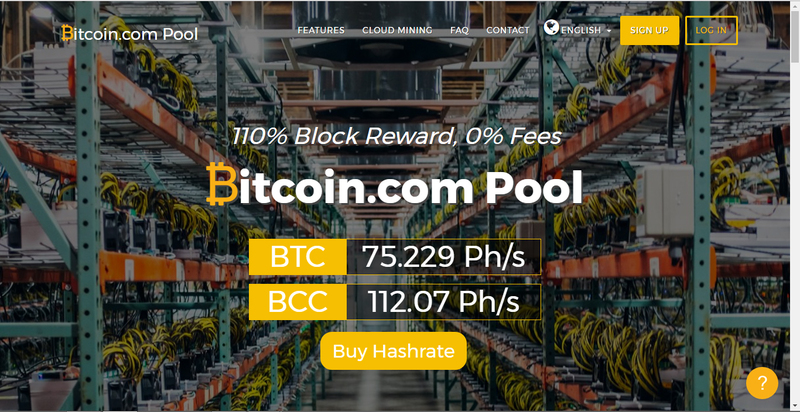 In addition to the hardware mining of Bitcoin (BTC) and Bitcoin Cash (BCC), pool.bitcoin.com offers cloud mining contracts, with guaranteed 100% uptime. This is indeed one of the few instances when cloud mining is legitimate, although profitability might still be questionable and it definitely warrants a second look. Apparently, the cloud mining services are offered in partnership with North America’s largest Bitcoin mining farm. The website features a handy calculator, which – based on current Bitcoin price and mining difficulty – tells users how much they can earn with the service per day, for a given hash-rate. The corporate entity behind pool.bitcoin.com is Saint Bitts LLC, but that’s pretty much all we get to find out about it. There is no address or registration information made available. The contact email is [email protected] The identity of the team members behind the operation is public though. Emil Oldenburg is the CTO. Shaun Chong is one of the developers, while the BU (Bitcoin Unlimited) side of the project is handled by developers Andrea Suisani and Andrew Stone. It has to be noted that the powers behind pool.bitcoin.com have been strong proponents of the BU hard fork. Although the operation is not particularly old yet (it has only been around for a year or so), the answer to that question has to be yes for the time being. There is a lot of discussion regarding the service on various forums, and although people acknowledge that over 90% of cloud mining services are blatant scams, this one is very unlikely to run with one’s mined bitcoins. What’s more, the offered mining contracts seem to be profitable too. The Bitcoin.com Mining pool offers three types of cloud mining contracts, each of which seem to be out of stock right now. To get started, one needs to buy such a contract and to do that right now, the client is required to join a waiting list. One can also subscribe to receive email notification when new stock is added. Throughout the three contracts, users can switch between BCC and BTC for free. Why exactly does pool.bitcoin.com offer such profitable contracts, when they could just handle all the mining themselves? According to the explanation provided by Roger Ver at bitcointalk, they are looking to expand the pool, and this is the best way to go about it, especially that – despite their attractive prices – they still make a profit on each contract too. The first contract is a 12-month plan, the initial cost of which is $1.195, and which features daily fees of $1.40 for a 5 TH/s hash-rate. For this rate, the current daily return is $4.93 and the minimum hash-rate purchase is 2 TH/s. The contract, like all the others, features a slider gauge, through which different hash-rate purchases can be set, with the system calculating and updating all the afferent information. The second plan is a lifetime one (it essentially lasts as long as it’s profitable) and it costs some $1,645 for the same 5TH/s hash rate. It comes with the same daily fees and daily returns as the above described contract. The Lifetime Plan Pre-order 2 contract is essentially a pre-order of a lifetime plan, with a much better hash rate cost. While with the above described cost per TH/s is $329, with this plan, it is a mere $289. This is indeed the best available deal, but – as said above – it too is out of stock for the time being. The payments miners get based on their contracts are delivered daily, in bitcoins or Bitcoin Cash, depending on currency the for which the contract was signed. Automatic withdrawals can be set up directly through the console. Users are not required to do anything after they pay for a mining contract. All the actual mining is done by the above mentioned mining farm, with Antminer S9 and Avalon 741 ASICs. There aren’t any serious and verifiable issues in this regard. Users complain about various features every now and then, but the bottom line is that they always agree the operation is legitimate and even profitable. The bitcointalk thread dedicated to the bitcoin.com mining pool is rife with various complaints. Some users have spotted suspicious mined blocks on the blockchain, others are complaining about the complete lack of mining instructions at the site for those who are indeed interested in actual mining and not the cloud-based stuff. Other issues covered in the said threads include front-end site downtime due to DDOS attacks, and problems with the auto-withdrawal. Eventually, most of the problems are sorted out by support dealing with the user directly, or just fixed as part of everyday operation. No one has complained about having had his/her mined coins stolen in any shape or form. Bitcoin.com’s Mining Pool belongs to a very disreputable industry/vertical, and therefore it is difficult for potential miners to build up trust. This does appear to be one of the very few legitimate cloud-mining operators though. The numbers add up, there is indeed real, hardware mining happening and the user feedback – though far from spotless – is for the most part positive. If you have any experience or complaints concerning Pool.Bitcoin.com, we encourage you to share your feedback in the form of a comment below! For legitimate mining opportunities and more mining related reviews, you’re welcome to visit our Cryptocurrency Mining Guide. To learn about other scams infecting the cryptocurrency domain, feel free to subscribe to ScamBitcoin.com. I tried to purchase a cloud mining contract on Dec2/2017. I followed all their instructions to make the wire transfer. They claimed after one week that they had not received it. They then advised me that the company name had been changed and that my wire transfer would be returned and I could send a new one to the new company name. I traced my wire with my bank and it shows as delivered. I still have not received my refund or any cloud services. I have contacted Shaun CHONG and Nathalia Ra their CFO. THEY reply that they will make things right but nothing has happened yet. – Contracts prices have increased by +50%. – No longer 0% pool fees, it’s now 2% on BCH, even for old contracts.